The Monday after Christmas we decided to get out of the house for some fresh air, and headed to the zoo. It was chilly - about 40* with a breeze, but we wore heavy jackets and it wasn't too bad. 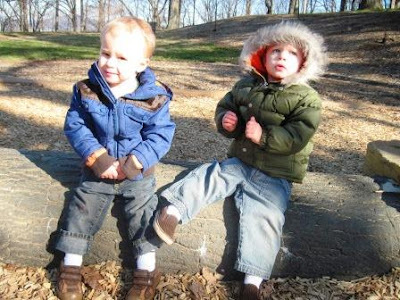 Certain little boys had cold hands, due to their refusal to wear gloves, but they managed. I didn't take any pictures of the animals this time, since I've blogged on the animals of the zoo so many times before. Instead, I took a bunch of playground photos. We always save the playground for last. The monkeys (animals, not my boys) were making some funny noises this day. The boys were all impressed, and proceeded to make monkey noises off and on the rest of the day. My favorite animal, the Pallas Cat, was MIA again. What a bummer. He's the cutest little furry animal. On a brighter note, we got to see the otters being fed, and they were so playful dragging big branches of bamboo about and rolling and wrestling with each other and the bamboo. Come to think of it - my three aren't all that different from the otters, are they? We hit a second playground before heading out to grab some lunch. 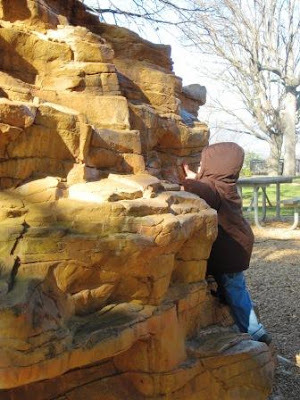 This one is a more natural playground with rocks, logs, and fossils to climb on. Reid didn't fall off the log, by the way, but he did look kinda tipsy, huh? On the top of this rock mass is a huge, slick, and very fast slide. It's for bigger kids, so we have to watch Pierce carefully as he climbs it, and the twins are allowed to do this one yet. Pierce is really getting to where he can hold his own though! Check out my giveaway for $30 from Fashion to Figure website here! Your boys are cuter than the animals anyway! Nice that the weather has been mostly mild so far making outings like these possible! It looks like a great outing! The playgrounds like wonderful! We played outside yesterday! It was great to get JDaniel out and about. Looks like a great day! I love the natural playground. What a fun place to be...especially for the boys, I would think. 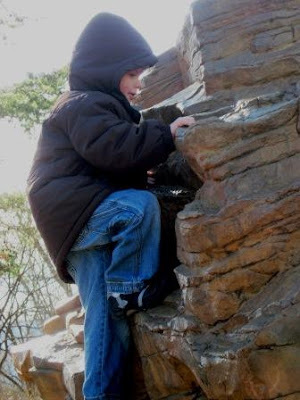 Pierce looks like a great rock climber! How fun for the boys.... but bbbbrrrrrr..... too cold for me. Of course I think I have heard you say you run in this kind of weather. What great fun! My big boy still loves going to the zoo, so do I ! I guess a person never out grows the zoo! Nice to have such gentle weather. the zoo near me has lots of indoors areas for the cold weather outings. i will have to look up the pallas cat, not familiar with it. The concrete log is exactly what I do! Faux Bois concrete. Zoos have some of the best. Great pictures and a fun time. What a fun outing-and it looks like you may have a little rock climber in the making! As always, I think your three little monkeys are just TOO CUTE! What a fun day you all had. I miss the trips to the zoo that I had with my son... he is 20 now! 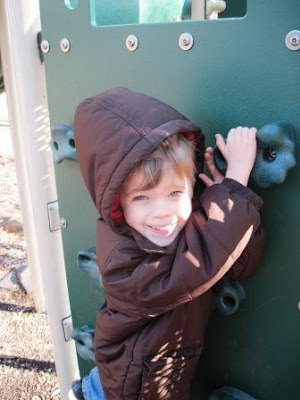 I bet there weren't too many other kids at the zoo with the cold weather! We always dragged our children out in the elements too. If they are exposed to it when they are young, then they won't be couch potatoes when they are older. It sure looks like they had a blast, cold or not! I've had fun visiting here this past year. Many blessings to your family in 2012! Looks like such a fun outing! I love all of the pictures but my favorite is the one of them on the slide. So cute!! What a great way to spend the day with little ones! Wishing all of you a very happy New Year! Super pictures of the boys on a chilly day st the zoo and playgrounds. I would rather see more pictures of them than the animals, anyway!! 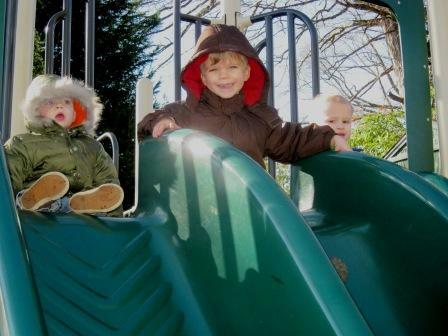 I was a nervous wreck with twin girls, I don't think I would have survived twin boys. Looks like fun though. What a fun happy day! 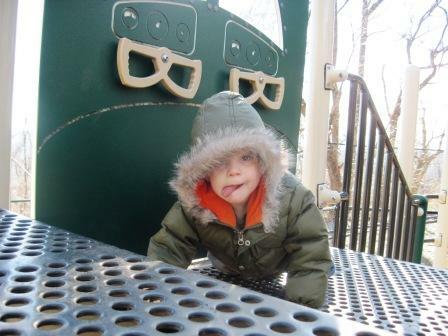 We love playgrounds too! oh and the zooooo- how fun! Your little treasured sons are too adorable. We can just imagine them making zoo animal sounds! They're so cute! Glad they got outside for some fun! This makes me miss my kids being little! I'd rather see the cuties pies anyway. Pierce is really growing up. Seems like loads of fun! Thank you so much for your lovely comment! Hoping you and your family have a Happy 2012! dear lisa, your little boys are so darn cute!!! wishing you and your sweet family a happy new year and the best for 2012!! Gosh, it just looks so darn cold to me! I am sure the boys enjoyed it though. Ugh, isn't a pain how none of them keep gloves on!!?? There's gotta be an easier way to keep little hands warm! 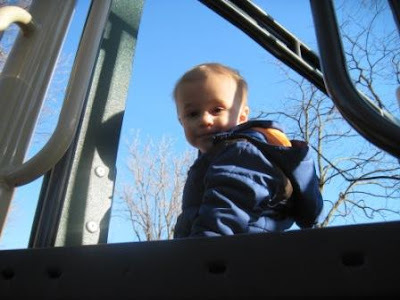 I really like that climbing rock playground! And now I'm going to google pallas cats to see what they look like! I send you wishes for a wonderful new year! AW... Looks like such a great outing. 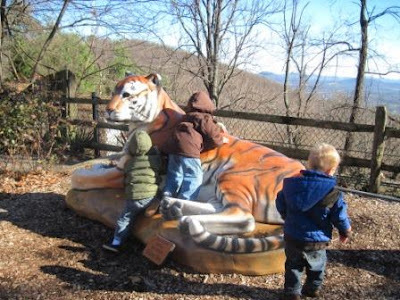 My kids also love the zoos. I should go more. They are open in the winter but I am always nervous of the cold weather. I love the zoo in the winter! It's so much less crowded. Looks like such a fun day. My kids would have loved the climbing. Brrr! It looks like a cold day, but a lot of fun!